[SOURCE: Universal Records Philippines] On October 15, 2013, an earthquake with the energy equivalent to “32 Hiroshima bombs” devastated the Visayas, and parts of Mindanao and southern Luzon. Two days later, the Loboc Children’s Choir sang, “The Prayer,” with the rubble of the hundred year old Loboc Church as their backdrop. On November 8, Typhoon Yolanda, the most powerful tropical cyclone of the year hit East Samar, Samar and Leyte. Thousands died. Millions were left hungry, desperate and homeless. This is where we took inspiration from the Loboc Children’s Choir’s performance. These children maybe from Bohol, but their innocent voices represent not just their home province but also earthquake-damaged Cebu, war-stricken Zamboanga, and typhoon-devastated Leyte, Samar and Iloilo — all of whom are praying for a miracle to allow them to rebuild their lives. And so we asking the help of various Filipino artists, to lend their voices, to represent our country and show the world that the Philippines has one voice, one prayer — that we work together to help our countrymen rebuild their lives brick by brick. The resulting song will be used to raise funds through downloads. The proceeds will go to the helpPH campaign, a project by the Philippine Disaster Relief Fund (PDRF). It is a non-profit organization made up of major companies from the private sector and leading NGOs. PDRF, organized in October 2009 after Typhoons Ondoy, Pepeng, and Frank to tap resources for reconstruction efforts during emergencies brought about by calamities, is one of the three identified institutional conduits approved by the Bangko Sentral ng Pilipinas to facilitate cooperation and coordination between the Philippine government and the private sector in formulating and implementing reconstruction strategies. It’s goal for Cebu, Bohol, Zamboanga and now the areas affected by Typhoon Yolanda is long-term solutions and programs that will bring businesses and jobs back to these areas. They are also planning to look into better designs for houses more suited for a country that gets hit by typhoons and earthquakes. And they are focusing on rebuilding the communities which includes: immediate help, provide housing, education by rebuilding school houses, providing economic incentives and livelihood opportunities. 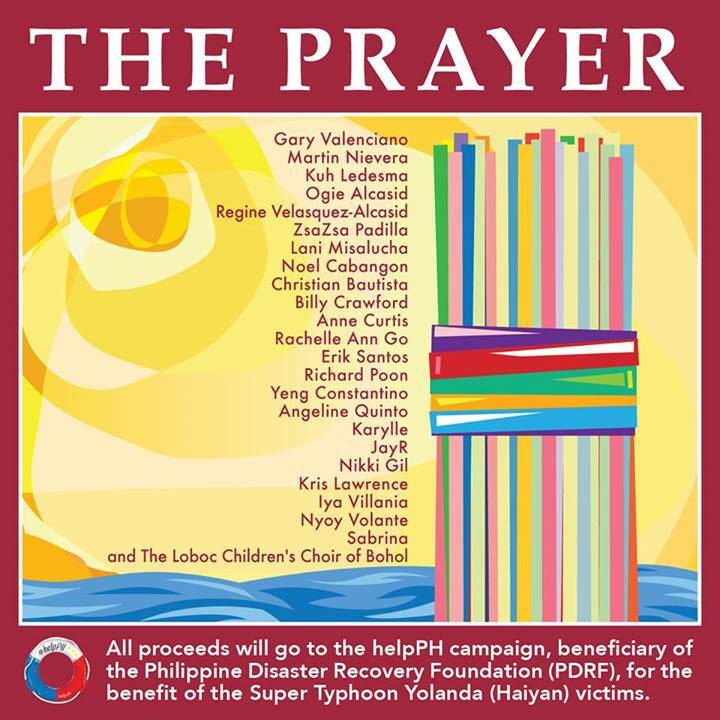 To download “The Prayer” visit www.spinnr.ph. I’ll Be There is the themesong for Julie Anne & Kristoffer Martin’s new TV Series entitled “Kahit Nasaan Ka Man” which airs on GMA7. Enrique Gil’s dance music video for ‘Oha (Kaya mo ba ‘to? ),’ the first single from his debut album ‘King of the GIL’ under Star Records. The country’s “Dougie King” will stage his first major concert at Smart Araneta Coliseum on November 29 with special guests such as Vice Ganda, Toni Gonzaga, Angel Locsin, Kim Chiu, Vhong Navarro, Jhong Hilario and Young JV. The latest single from Jonalyn Viray’s EP and one of the themesong from GMA7’s hit series, My Husband’s Lover. The video also stars GMA heartthrob Aljur Abrenica. Indiepinoy band, Kley releases the music video for ‘Hintayin’ from their self-titled album. The video features R&B singer JayR. Check it our below. Listen to Justin Timberlake’s new single “TKO”http://youtu.be/OJydK_V-7Ws from his new record The 20/20 Experience 2 of 2 out Sep30! Check out J. Cole’s music video for his 2nd single “Crooked Smile” feat TLC http://youtu.be/fzzMOMkjm8A from his 2nd album Born Sinner! Union J have unleashed their latest music video for “Beautiful Life” http://youtu.be/mE3v4Bv8NaY off their upcoming self-titled debut album! Watch Linkin Park’s lyric video for “A Light That Never Comes” http://youtu.be/RsKQOm_iJug for their new online game, LP Recharge.